These unions are designed to be installed between pipes made from dissimilar metals to prevent accelerated corrosion and deterioration in the piping system due to galvanic and stray current. 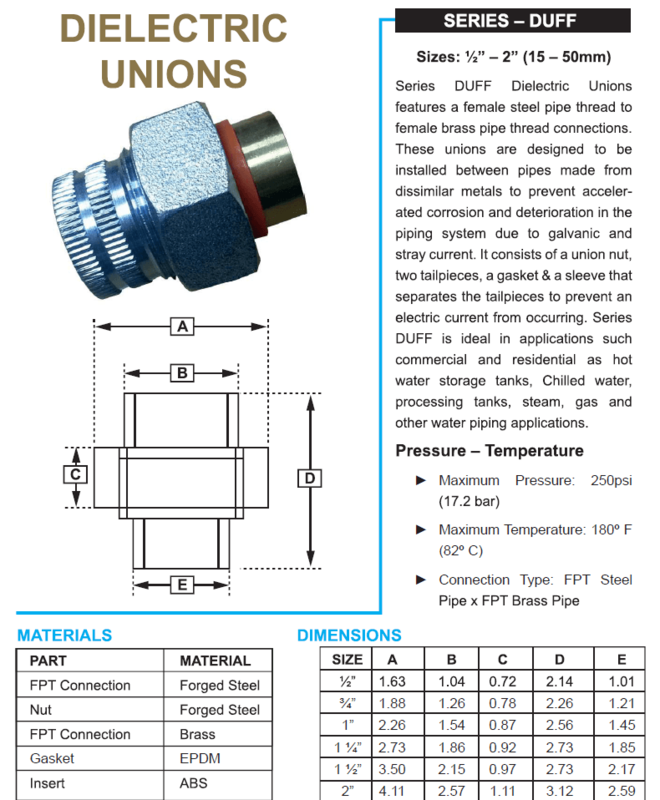 Dielectric Unions features a female steel pipe thread to female brass pipe thread connections. These unions are designed to be installed between pipes made from dissimilar metals to prevent accelerated corrosion and deterioration in the piping system due to galvanic and stray current. It Consists of a union nut, two tailpieces, a gasket & a sleev that separates the tailpieces to prevent an electric current from occurring. This is ideal in applications such as commercial and residential as hot water storage tanks, chilled water, processing tanks, steam, gas and other water piping applications. Copyright © 2019 ANBI Group All Rights Reserved.